Nasal congestion or stuffy nose is a very common symptom which may occur due to seasonal changes, cough and cold, sinus infection or for other health issues like weaker immunity. It is more frequent during the monsoon when the damp humid weather favors the growth of germs all around, and you catch a cold easily and end up blocking your nose. Fortunately, the problem of nasal congestion or stuffy or running nose in most cases is not considered to be a serious health issue and it goes within 2-3 days. But it may cause uneasiness in breathing properly or mild fever in some cases. However, the problem gets serious if you catch a very rough cold or if you are an asthma patient. Now, in case of serious congestion, it is best to consult a doctor but if in your case, it is simply due to weather change then you may like to try home remedies to treat nasal congestion. As I said, nasal congestion is not a serious health issues (in most of the cases) and it can be easily treated using simple and natural ingredients in the form of remedies. So if you are suffering from nasal congestion or running nose and wondering if there are quicker and easier way to get it treated then here’s the post worth checking. Today, I am sharing a few of the most effective and easy to apply natural home remedies to treat nasal congestion or stuffy nose quickly. These remedies can act as the first aid in emergency situations and it is important for all of us to have a fair idea about them and how they work in order to use them in time of need. Individuals with strong immune system, in most cases, can fight the problem of nasal congestion or stuffy nose quite well. But little kids and aged people are the ones who suffer more due to their weak immunity. If not cured early on, then the situation may become a little difficult. It is best to start the cure from the very beginning so that the problem does not increase. For that, however, you will have to identify the early symptoms and take measures to cure it early on. Listed below are a few of the most common symptoms you should look for. Although sudden weather change or monsoon mostly leads to cold and cough and eventually a stuffy nose. But they are not the only causes for having nasal congestion. There are other causes behind it as well, and it is important that you know all of them in order to prevent its frequent occurrence. Since the problem of nasal congestion is common, it is important for us to know about the best natural home remedies to treat nasal congestion and get instant relief. So, without wasting much time, let’s check these home remedies to treat nasal congestion or stuffy nose quickly. We all are blessed with a number natural ingredient that can be used as a remedy to treat various types of health issues, including nasal congestion. If you are suffering from mild nasal congestion and want to get it treated early on, then you may like to try some of these remedies as per your preference. However, if your congestion is lasting for too long even after using these remedies, then it may be due to some other health concern that may require immediate doctor consultation. 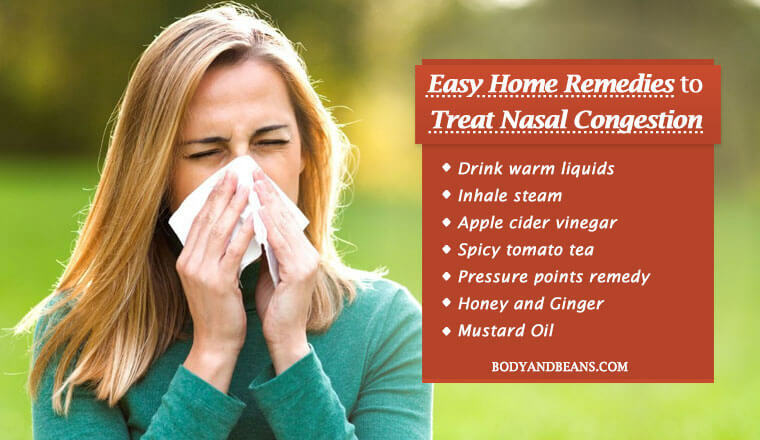 Listed below are a few of the most effective and easy to use natural home remedies to treat nasal congestion easily at home. The very first step that you must take to reduce the nasal congestion and get some instant relief is to drink some warm liquids. The reason behind it is because drinking warm water or any other liquid helps lose the mucus in the chest or the nasal passages that in turn, moistens the throat and prevent your body from getting dehydrated. In fact, experiments have been conducted by the researchers at the Common Cold Center of Cardiff University, Britain and it was found that those who drank hot beverages got quick relief from symptoms like runny nose and many others like cough, sneezing, tiredness, sore throat, chilliness etc. So if you are suffering from mild nasal congestion then maybe you can try drinking like warm water, hot soup etc for quick relief. This age-old remedy is definitely one of the best home remedies to treat nasal congestion or stuffy nose quickly and hence it is a must try. This is because when you breathe in the hot air, it loosens the secretion that was so long causing stuffy nose, chest and head and you get that instant relief. Moreover, steam is not just a remedy for nasal congestion but also it is very effective in case of various other respiratory troubles like sinus and influenza. Just take a steamer and fill it up with boiling water. You may also add few spoons of fresh or dried herbs like rosemary, mint, lavender, eucalyptus etc. Then you need to put your head down over the nozzle, place a towel round your head and inhale the steam. Make sure that the steam does not escape. Now, slowly, breathe in and out and continue till the time you feel the relief. However, be a little careful not to burn your face in the process. It is best to keep around 8-10 inches distance between your face and the boiling water, and if you realize the heat of the steam is to bearable, then wait for a while and allow it to cool down a little. You may find it surprising but the apple cider vinegar tonic is one of the best home remedies to treat nasal congestion or stuffy nose. Well, this is due to the fact that the acid in apple cider vinegar helps in thinning of the mucus which leads to it moving out of your respiratory system really fast. Also, apple cider vinegar being antimicrobial in nature helps in fighting the pathogens and does not let the cold and cough or the stuffy nose problem to last for long. Take water in a glass and add a tablespoon of apple cider vinegar in it and then drink it. Do this 2-3 times in a day for fast relief. Alternatively, you may also add some apple cider vinegar in steam remedy before inhaling the steam. A warm compress is capable of giving you immediate relief for the nasal congestion or stuffy nose if you use and execute the remedy the right way. It actually opens up the nasal passages from the outside and thus helps in unclogging a stuffy nose. To get instant benefits, you just have to take some warm water and soak a towel in it. Then squeeze the excess water out of the towel and then after folding it, place it over your nose and forehead. Repeat the process at regular intervals for faster results. Trust me, the warmth will give you enough comfort from any kind of pain and will also relieve you off the inflammation inside your nostrils. If the studies conducted by the scientists of the University of Michigan are to be believed, then it is the saline nasal sprays or saline water rinse that can help you deal with the problem of stuffy nose, sinus pain and other chronic nasal or sinus problems better. In the study, the participants used 8oz saline water two times in a day and showed amazing improvement in comparison to the other participants who did not use it. Each one of us have salts readily available at our home and so whenever you are suffering from stuffy nose or nasal congestion, you can easily use the saline solution to get relief. All you need to do is to take some warm water and mix a teaspoon of table salt in it. After that, use a dropper to pour the solution inside your nostrils. You may also use a neti pot or a plastic squeeze bottle to rinse out your sinuses effectively. Now, using mustard oil to treat nasal congestions has been an old age traditional remedy but this trick did work over the ages. Indeed, it is one of the best and easiest home remedies to treat nasal congestion quickly and if you are OK with its smell, then you must give it a try. It will unclog the nasal passages, remove the mucus formation within a short time and will give you relief from the uneasiness. All you need to do here is to take 2-3 drops of mustard oil and pour it inside your nostrils. Well, it will give you bit of a burning feel but it will be OK after some time. However, be a little careful so that it does not enter your eyes. Acupressure is certainly a solution for many health complications especially for curing respiratory diseases and treating the problem of nasal congestion or stuffy nose is no exception. This is because if you are able to hit the right pressure points on your nose, it will significantly reduce the swelling or the blockage in your nasal passages and in turn, will increase the free flow of air from your nose. However, you have to be careful not to hurt your nose in the process. So, it is best to learn more about the best acupressure points for nasal congestion and then try this remedy. Ever wondered how a simple tool like a humidifier can be used to treat nasal congestion? Yes, you can actually use a humidifier to treat nasal congestion or stuffy nose easily. The reason why it is so effective is because the machine converts the water around into moisture that fills up the room slowly, thereby leading to an increase in the humidity in the space. Now, when you breathe in this moist air, it actually soothes your irritated tissues and swollen blood vessels inside your nostrils and sinuses. Moreover, humidifiers also help in thinning of the mucus in your sinus which, in turn, helps in emptying the fluids inside your nostrils and let you breathe normally again. However, remember to use cool-mist humidifiers as it is proven to be a better option for treating cold. Spicy things are always good in treat nasal congestion and when it comes to spicy tomato tea and that too hot, it is even more effective. The reason why spices are so effective in treating nasal congestion is because of the presence of capsaicin in them which is nothing but the chemical which gives a burning sensation on your tongue once you eat or drink anything spicy. Capsaicin actually helps by irritating the mucus membranes in the nostrils making them inflamed which in turn, trigger your nose to ‘run’. In other words, it unblocks your stuffy nose. Also, if you were having some pain, capsaicin will help in killing that pain as well. In fact, tomato tea will not just reduce the inflammation inside your nose but will also open up your sinuses. To make a spicy tomato tea, you need to take a tomato and grate it. Then you need to boil the cup of tomato juice along with some chopped garlic, 1 teaspoon of lemon juice, pinch of Himalayan salt and some chili sauce. Drink this tea hot two times daily and enjoy the results for yourself. Needless to say that if you eat right, you will be able to prevent many of your health and beauty issues, and there is no exception when it comes to treating nasal congestion as well. You must be aware of what foods you need to eat while suffering from stuffy nose, and what not to eat ,because some foods prevent the formation of mucus while others add up to it, thereby increase your discomfort. In a 2006 study, it was clearly concluded that having a diet rich in meat, refined carbohydrates and high in sodium can actually lead to the formation of mucus while those rich in fiber, fruits, vegetables and soy can limit its production. So, you must keep this in mind if you are determined to get rid of your stuffy nose problem quickly. Ginger is a wonder ingredient as far as treating nasal congestion is concerned. It will help you unclog your nasal passages and make your breathing normal again. Also, it has got anti-inflammatory properties that help in reducing the inflammation in your nostrils. You can use ginger in two ways to get the maximum benefits in treating nasal congestion. Firstly, you may drink ginger tea two times a day. It will relieve you off the cold or you can use ginger as a compress. For that, you have to take a slice of ginger root and boil it with 2 cups of water for around 15 minutes. After that, soak a fresh cloth in the brew and then place that gently over your face for around 15 minutes and enjoy the relieving feel. Honey, in general, is great for cold and you can definitely use it to treat the problem of nasal congestion or stuffy nose. It will definitely unclog your nasal passages and make your body warm and give you relief from the cold and the discomfort. In order to get the maximum benefits in nasal congestion treatment, you just have to consume two teaspoons of honey in the morning or before going to bed. You may also consume it along with milk, lukewarm water or tea. If you make honey a part of your bedtime routine, I am sure you will not catch cold or suffer from a nasal congestion frequently. When you are suffering from a bad nasal congestion, you really have difficulty to sleep at home but if you plump up your pillows, you will definitely get enough respite from the problem. This is because when your pillows are plumped, your head is in a raised position and that helps in the prevention of the congestion from going into the lungs and this will stop you from having a painful cough at the middle of the night. Moreover, it also prevents tinnitus which is otherwise one of the biggest side effects of having a stuffy nose. Over to you: which is your favorite remedy for nasal congestion? Nasal congestion causes serious discomfort while breathing. The stuffier your nose gets with all the mucous formation, the greater will be the uneasiness. Now, this is seriously a matter of concern because when you are not being able to breathe properly, it gives you a feeling that you are too tired and ill which is in no way a pleasant feeling. Hence, the problem is not just physical; it causes a lot of discomfort as well. The problem intensifies if any individual is a victim of some respiratory disease like asthma beforehand. In such a case, I would recommend an immediate visit to the doctor. But, if you are having the mild nasal congestion due to catching a cold or exposure to pollution or due to some minor allergies etc., then the home remedies will be the best option for you to try. This is because they will give you fast relief and the best thing is most of the time the ingredients required are readily available in your home, so they kind of act as the first aid. In my today’s article, I have already shared with you the top 13 home remedies to treat nasal congestion or stuffy nose easily and quickly. All of these remedies are very effective and many of them have already been scientifically proven to show great results in case of nasal congestion. And, the best thing is if you do with little care, these are safe options to try and the remedies are also very cost effective. I have myself used some of the remedies like the steam remedy, the mustard oil remedy and also the honey remedy whenever I have suffered from cold and nasal congestion. Also, I have maintained a healthy diet that added to the faster relief from nasal congestion. 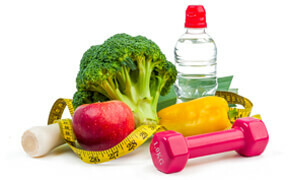 So, I believe that if you take the help of these remedies, you will surely be benefitted. It is not that you will have to use all of these. Just pick up your favorite one or give some options a try and stick to the one which has given you the best results. So, are you suffering from nasal congestion? Then it is time to try any of the above home remedies to treat nasal congestion. And please do share your feedbacks after using the methods and also tell us if you know any other natural remedy which you have used to treat nasal congestion and have been benefitted. And if you have already tried and benefited from any of the above or other remedies in treating nasal congestion, then feel free to share that as well. Also, if you have any queries or suggestions, feel free to let us know. And, if you like my posts, then please do support us by liking, commenting and sharing the posts with others. Your one motivation means a lot to us. Until then, stay happy, stay safe.